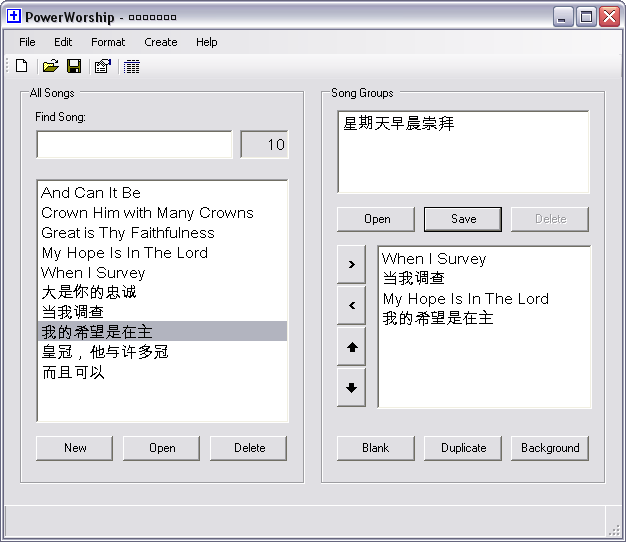 PowerWorship 3.2 offers support non-English languages but there are some basic configuration changes required to enable this support for languages that use different character sets. Many languages will require the encoding to be changed to something other than the operating system default - depending on your specific computing environment. The recommended encoding for PowerWorship 3.2 when working with international languages is UTF-8. This can be set by editing the program settings (Edit menu > Settings) and selecting UTF-8 encoding on the Environment tab. 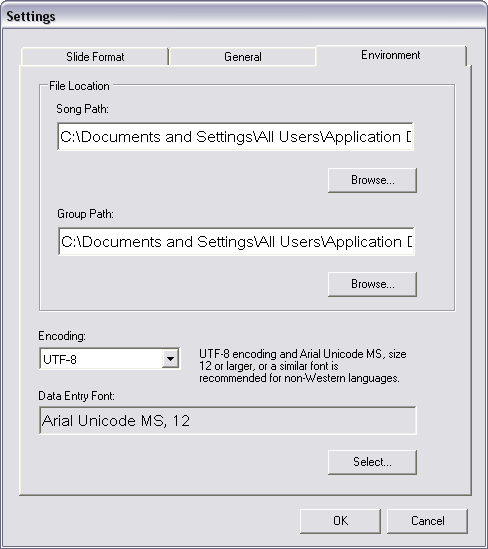 It is also recommended to change the data entry font to Arial Unicode MS or a similar font, to allow the input and display of different character sets. Once you have changed the encoding and data entry font settings, you can then add songs to PowerWorship using the language of your choice. Here is an example showing 5 songs in American English and the same 5 songs in Simplified Chinese. 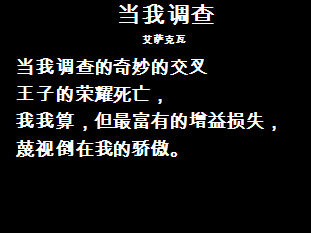 Slides will be generated from the lyrics, etc. that you enter when adding songs. If you use a service such as Google Translate to translate songs and copy and paste them into PowerWorship, be aware that you may need to delete and reenter the slide break characters (i.e. the # character) depending what happens to them as part of the translation. Here is an example of a bad slide break character which has the appearance of extra padding and/or a leading space after translation. Here is the slide break character after it was corrected (i.e. deleted and reentered manually). If you experience any problems with slide break characters showing up in the generated slides (instead of causing an expected slide break) there's a good possibility you will need to fix up the slide breaks manually to correct the problem. 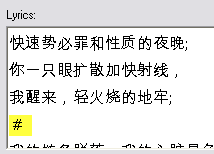 PowerWorship 4.0 does not yet support national language characters associated with certain non-English languages. Support for non-English languages is planned for an upcoming PowerWorship 4.0 maintenance release. PowerWorship 3.2 (which supports PowerPoint, but not OpenOffice) is recommended for non-English language use, for the time being - until PowerWorship 4.0 provides the same level of NLS character support, in the upcoming maintenance release (4.0.3) planned for early 2014. Note: Licensed users of PowerWorship 3.x may request a free upgrade to version 4.0 for up to one year after the original license purchase date, by emailing support AT powerworship DOT com.